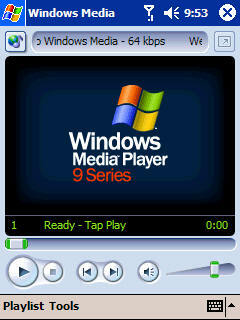 Filed Under : Categories,Freeware,Teknologi by Rusliawan S.
Get more play, your way with Windows Media® Player 9 Series. Get fast and flexible playback with the best audio and video quality for Windows and the Web. Includes special new features optimized for Windows XP. Fast and Flexible Playback: Discover the Info Center view for WMA, MP3, and DVD. Get instant-on/always-on streaming over broadband. Discover more flexible playback with new Mini-Player & Full Screen modes. The first all-in-one, Smart Jukebox: Keep your media organized with Smart Jukebox features. Be your own DJ with Ratings and Auto Playlists. Quickly burn Audio or Data CDs with ease. Best Audio and Video: Revel in unmatched sound and stunning video! Getting Started: Get up to speed fast with this guide that makes it easy to discover and enjoy the powerful new features of Windows Media Player 9 Series. Content Showcase: From music to movies to gaming, our content showcase presents exciting content created with the breakthrough Windows Media Audio and Video 9 Series codecs and delivered by Windows Media Services 9 Series for instant-on/always-on streaming. Crank it up: Check out new skins, visualizations, plug-ins and more! Devices: Windows Media Player 9 Series with Windows XP offers powerful new features that make it easier and more fun to enjoy your media throughout your home or on the go. Get Set Up For 5.1 Surround: Follow our step by step overview to surround yourself with 6 channels of sound! HighMAT CD Burning: A new option for CD burning, HighMAT makes it easy to save personal digital music and video created on your PC to recordable discs that work seamlessly with next-generation consumer electronics devices. (Windows XP version). Synchronized Lyrics support: View or add your own synchronized lyrics to music files. Displayed as captions, synchronized lyrics are displayed in Now Playing and Full Screen modes.